The Texas Association of School Personnel Administrators (TASPA) announced that Governor Rick Perry proclaimed Wednesday, October 13, 2010 as Texas Education Human Resources Day. It is anticipated that this will become an annual event in the month of October. 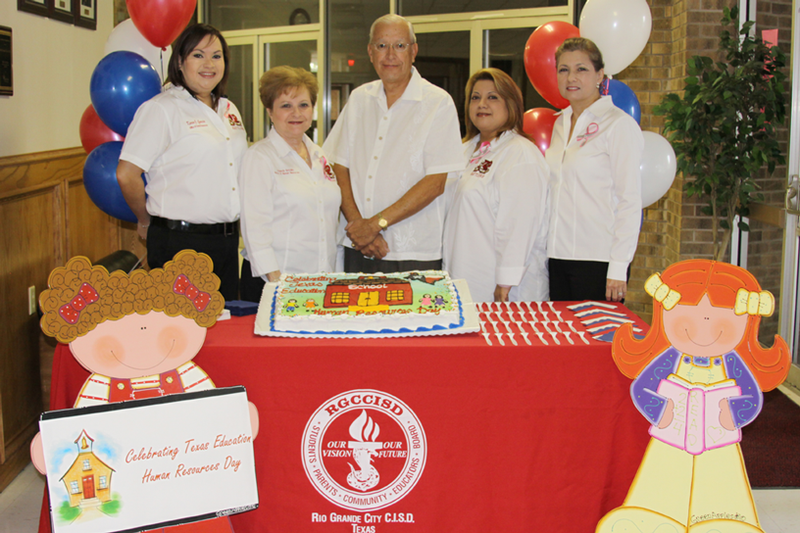 The RGCCISD Human Resources Office headed by Mr. Gilberto E. Garcia-Assistant Superintendent for Human Resources, serves close to 2,000 employees. Some of the functions of this department include facilitating the recruiting of new personnel, screening, and selection of teachers and support staff for the District by monitoring unfilled position, posting job vacancies, and processing criminal background checks for potential hires, new employees, and volunteers. The department also oversees salary administration, processes employee complaints and grievances, reviews and develops personnel policies, monitors the evaluation and recommendation process by distributing evaluation materials and establishing time-lines. The Office of Human Resources abides with rule-making bodies by ensuring equal employment opportunity implementation and following State Board for Educator Certification and No Child Left Behind guidelines. This office also oversees the district's Los Nuestros Educational Foundation, New Teacher Orientations and the Recognition Banquets to honor retired personnel and Los Nuestros Educational Scholarship recipients. This department remains vigilant throughout the year for legislative changes, any mandates and implements all changes as dictated by the governing agencies. The personnel at the Office of Human Resources are commended for their dedication to the students and district personnel of Rio Grande City CISD.